The film is a celebration of parrots: their intelligence, sociability and beauty. It is also a taking stock of parrots at this moment in time, both captive and wild. I was first exposed to parrots 20 years ago when a family member purchased a Yellow-naped amazon. She had no concept of the commitment the bird would require. It was a disaster for the family — and for Rico, the parrot. If only someone had informed them before they made the purchase! I’ve always wondered what happened to Rico. And, I’ve always felt I needed to make it up to him. Fast forward to 2012: I often drop off old towels and blankets at my local Animal Rescue League. In past years, the facility has been filled with dogs and cats — perhaps an occasional parakeet. But more recently, larger parrots have begun to appear. I’ve watched as these parrots have lingered for months before finally finding a home or being transferred to another facility. And then, just last year, I met two neighbors — ordinary people who have adopted multiple parrots because these unwanted birds had no place to go. Wow. 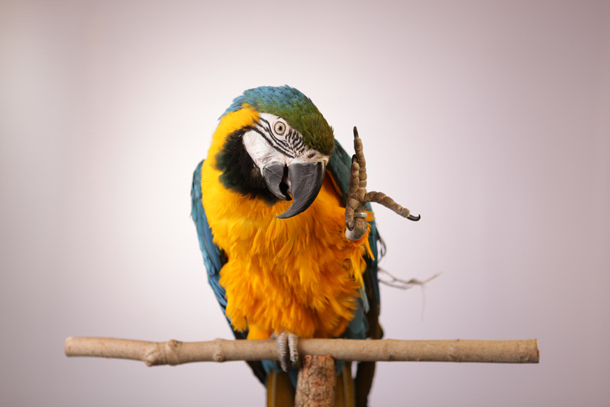 I began to dig a little deeper and learned that there are parrot sanctuaries and rescues across the country — and that most of them cannot keep up with the demand to take in unwanted parrots. When I finally paid a visit to one such sanctuary with over 500 birds, I knew I had to tell this story. And so, in honor of Rico, I began the long, fascinating, sometimes arduous journey that has led to “Parrot Confidential.” The film is a celebration of parrots: their intelligence, sociability and beauty. It is also a taking stock of parrots at this moment in time, both captive and wild. In telling this story, I felt it was important to connect the dots between the wild and our “companion” birds. For many who have only seen parrots perched in cages, picturing them in the wild can be an alien image. Having the privilege to observe parrots in the wild — watching them interact with one another, care for their young, and fly freely — is nothing short of extraordinary. It is also a critical reference for life in captivity. “Parrot Confidential” highlights eight individual parrots. Through their stories, we are given a window into their lives, the complexities of their social needs and the ongoing challenges facing those who try to provide for them. In honor of Rico, I hope that this film will reach those who are contemplating the purchase of a parrot. I hope the film will allow them to make an educated decision about whether they truly can provide for a parrot. If the answer is “yes,” then I hope they will consider adopting one of the thousands of parrots in need of a home. For those who feel they are not up to the task, perhaps they will consider volunteering at a parrot rescue or making a donation. No matter what, I hope that we will all support efforts to protect these magnificent creatures in the wild so that they will continue to fly free.